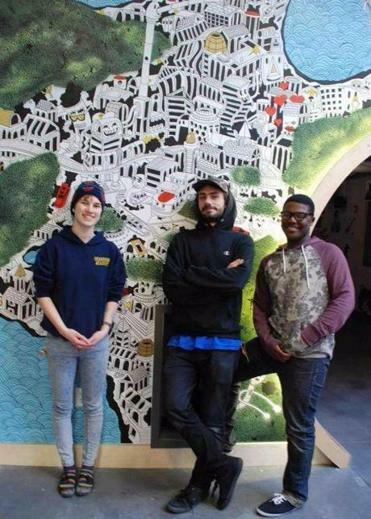 Muralist Ben Jundanian (center) with mural participants on a recent project. The project begins Tuesday, Feb. 2, when muralist Ben Jundanian takes over the gallery space. Known for his whimsical cityscapes, populated by roadways, waterways, and train tracks, Jundanian “believes in drawing not what you see, but what you’re thinking about,” Curry said. Would-be artists who wish to participate during the month of February are invited to stop by New Art Center any Tuesday through Saturday between 1 and 6 p.m. to leave their mark. Admission is free. New Art Center is at 61 Washington Park, Newtonville. For more information, call 617-964-3424 or go to www.NewArtCenter.org. INTERNATIONAL TASTES The Belmont Food Collaborative offers “Flavors of Belmont,” a series of hands-on cooking classes Tuesdays that will feature Italian, French, and Indian cooking. Classes are Feb. 2, at 11 a.m. (French cuisine), Feb. 9, at 7 p.m. (Italian cuisine), and Feb. 23 at 7 p.m. (Indian cuisine). More offerings will be held in March. Classes are held in the kitchen of the First Church in Belmont Unitarian Universalist, 404 Concord Ave, Belmont. Cost is $58 per person per class (sign up for each one separately). For more information or to register, go to www.belmontfood.org. SING A SONG Musicians/vocalists Ellie Foster and Brad Goff are teaming up with Arlington Community Education for the second annual Sing, Sing, Sing, a drop-in, no-commitment singing celebration open to anyone who loves to join with others in singing new arrangements of popular songs. The event takes place Saturday, Feb. 6, from 7:30 to 9:30 p.m. at St. John’s Episcopal Church, 74 Pleasant St., Arlington. Admission is $5 online or $10 at the door. To register or for more information, go to www.ArlingtonCommunityEd.org. BUILD A SNOWMAN The Town of Acton Recreation Department celebrates winter once again with its annual Winter Carnival at NARA Park on Saturday, Feb. 6, from 4 to 7 p.m. Admission is free. Planned activities, depending on the conditions, include skating, sledding, a “Frozen” DJ Dance Party, Poi Firespinner Michael Farrell performing two 15-minute shows, snow broomball with the Acton-Boxborough boys’ lacrosse team, and more. Please bring your own sleds, ice skates, and helmets. Food will be available to purchase (cash only) by onsite vendors. NARA Park is at 25 Ledge Rock Way, Acton. For more information, go to www.acton-ma.gov/events. WINTER BLOOMS Throughout the month of February, Tower Hill Botanic Garden will be hosting “Winter in Bloom: A Month of Flowers.” Activities on Fridays, Saturdays, and Sundays throughout February will include botanical guest speakers, hands-on workshops, live music, flower shows, and activities geared to all ages. Tower Hill’s lush conservatories filled with subtropical plants provide a welcome break from the winter chill. For more information or to register for upcoming events, go to www.towerhillbg.org or call 508-869-6111. Tower Hill Botanic Garden is at 11 French Drive in Boylston. Admission is $12 for adults, $9 for seniors, $7 for ages 6 to 18, and free for children 5 or younger. FREEDOM UNDERFOOT Germaine Ingram, a civil rights lawyer and tap dancer who has pursued social justice both on the stage and in the courtroom, will perform “Freedom Underfoot” — a look at the final year of the Civil War in Atlanta — on Tuesday, Feb. 2 at 2 p.m. at Brandeis University’s Shapiro Campus Center Theater, 415 South St., Waltham, with musicians Jacqueline Pickett and Diane Monroe. Ingram’s keynote address, “The Law and the Stage: Platforms for Pursuing Social Justice,” will be held Wednesday, Feb. 3, at 7:30 p.m. in the Shapiro Campus Center Theater. Both events are free and open to the public.